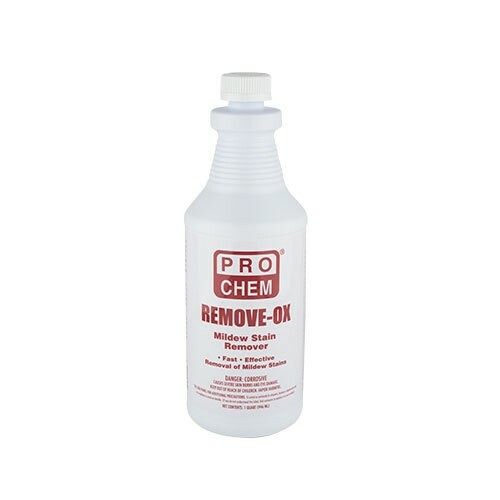 REMOVE-OX | Pro Chem, Inc.
REMOVE-OX is a highly effective, pleasantly scented stain remover for bathroom tile, grout, shower stalls, shower curtains, mats, vinyl canopies, boat and camper tops, refrigerator gaskets or any area where mold and mildew accumulates. Contains special wetting agents to ensure product penetrates into the pores of grout, cement and other hard-to-reach places. Simply spray REMOVE-OX on surfaces to be cleaned. Allow five to ten minutes of contact time. Rinse with tap water. Extra-tough stains may require reapplication and agitation with a stiff brush or sponge. Do not allow contact of this product with clothing. Not recommended for use on aluminum or other soft metal surfaces.